Ultimate Burgers! | Super Stay At Home Mommy! Your life will never be the same after a bite of these delicious burgers! You will never want a plain old burger ever again! Start by frying up your bacon, you’ll want it nice and crispy. Crumble. Place hamburger meat in bowl, mix in crumbled bacon, salt, pepper, Italian seasoning to taste (about 1/4-1/2 tsp per burger), one egg (Yep, I use the whole egg, not just the yolk), and a sprinkle of breadcrumbs. Be careful not to overdo it on the bread crumbs, you’ll dry out your burgers. Form hamburger patties, and grill to desired done-ness. Before you take them off the grill, don’t forget to put your cheese and Pastrami on top! Meanwhile, poach you eggs. If you don’t know how to poach eggs, here’s a link to help, Easy Poached Eggs. And don’t be overwhelmed, it’s not that hard! 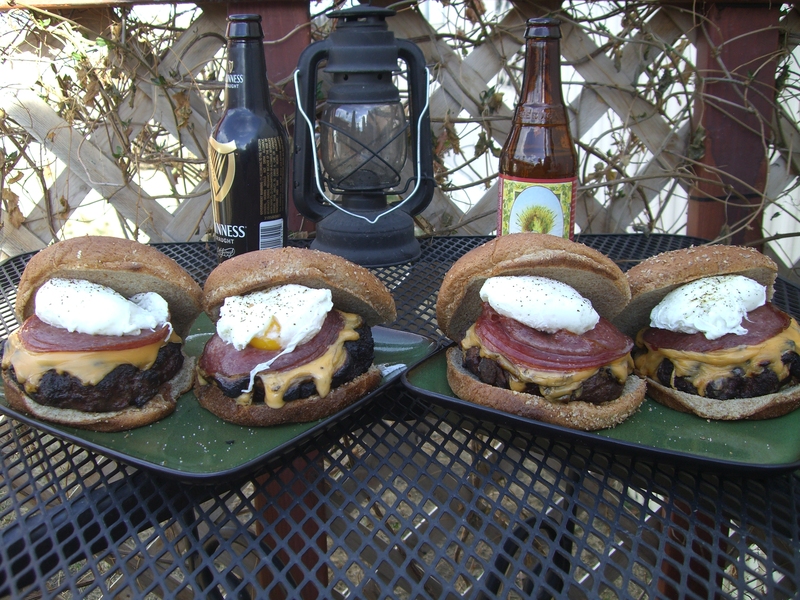 Plop your burger on a bun, and top with poached egg. Cut burger in half and watch the yolk spill, mmmm….. you don’t even need ketchup for this burger, the egg tops it off perfectly! Enjoy!! Nothing goes better with an awesome burger than a beer! We learned the hard way that 2 burgers was WAY too much. One burger per person is plenty 🙂 Grill some up, and let me know what you think! LOL, it really is! We’ve made these a few times, and they are just as good using 1/4lb per burger.